Isabel Ortiz from ILO presents during the CSPF panel on Assessing Austerity and Its Alternatives. 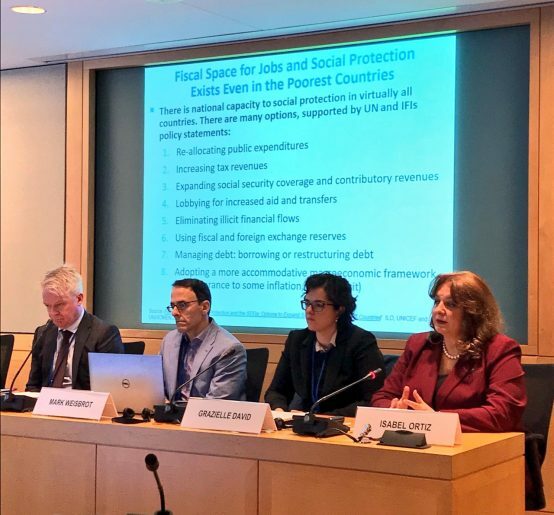 Notes from the 20 April Civil Society Policy Forum session on assessing austerity and its alternatives 10 years after the global financial crisis at the World Bank and IMF's Spring Meetings. Moderator: Nicholas Lusiani, Director of the Human Rights in Economic Policy Program at CESR. What is the scale and scope of fiscal consolidation worldwide today? What have been the economic, social and political consequences? Have these adjustment measures been always necessary? What are some fiscal alternatives to prevent the need for austerity by expanding fiscal space? How might they be best implemented? How might the IMF help to expand fiscal space in countries facing fiscal stress to prevent the worst impacts of austerity? Is fiscal consolidation good economics? How might a country facing a fiscal crisis (characterised by spiking sovereign debt spreads) avoid fiscal austerity in the short-run? What are some longer-term ways to prevent more chronic forms of austerity? Isabel Ortiz, ILO: From 2010-2020, after a short period of fiscal expansion, a push happened where countries cut expenditures rapidly, and that although we often hear about austerity in Europe, most of austerity programmes take place in developing countries. How are countries going to achieve the Sustainable Development Goals (SDGs) if their fiscal space is contracting to this degree? Often universal subsidies are removed but not replaced with anything, leaving countries cutting or capping wage bills, for example. This is an important trend because it has several impacts on right to education and social protection etc. Targeting strategies are used instead of universalism, but it is a de facto contraction of coverage. Grazielle David, INESC: Austerity in Brazil will last 10 or maybe 20 years, which will freeze primary expenditures, mostly social expenditures and infrastructure. This has resulted in chronic underfinancing, creating a major reduction of public expenditure. Labour reforms, pensions reforms, privatisation, budget cuts on public policies run in contrast to the promotion of human rights rights and the SDGs. Since 2013-2017, 58 per cent budget cut on tackling violence against women has been cut in Brazil (see Observer Spring 2018). Progressive tax reform has the potential to be one of the best strategies as an alternative to austerity. In Brazil, they face major increases to Value Added Tax (VAT). Simple progressive measures could have avoided austerity measures and invest in socially beneficial areas of social investments and income redistribution. Mark Weisbrot, CESR: The IMF almost explicitly endorsed a fiscal rule of not increasing spending about inflation and not taking into account demographic or economic changes, and one of the examples of this is Brazil. Austerity is a political agenda, which has been highlighted throughout Europe. The desire to do whatever it takes to preserve the Euro when its future was called into question was used for changes in policy. Overwhelming focussed on measures that would directly reduce wages or would create downward pressure on wages. They did not seem to care whether you needed to increase labour supply, and there was very little correlation between labour market outcomes and the reforms. Duration of recession was a policy choice because of the measures taken after it. The IMF has changed its speech on issues. We have always welcomed policy change – flexible credit lines, for example. I agree there’s more flexibility, but I want to see a policy match to the rhetoric. Gudmundur Arnason, Iceland: Our economic trajectory is such that we have grown out of the crisis in Iceland. Iceland was described as the perfect storm. We managed to get new banks going within a year, but still we are resting with legacy issues accruing from the structural collapse as the crisis led to a collapse in central government revenue and public expenditures. When the crisis hit, Icelandic authorities put an emphasis on consultations with social partners. It was essential that unions, and social partners were part of this, and played a part in decisions around how expenditure strategies are carried forward. Nordic countries have a tradition of an active dialogue between countries and authorities, and a consensual approach to social cohesion and to pursuing egalitarian economic policies. The tax system was changed, and new taxes were created, including the introduction of a wealth tax and a steepening of progressive income tax structure and better targeting of social benefits. On expenditure, there was a broad agreement to preserve as much as possible. Our cooperation with the IMF was exemplary and mutually beneficial, but some of the social ideas in Iceland were not part of the status quo agenda. Every stone was turned to try and protect the most vulnerable, through taxation, through social benefits. Was this a lost decade for Iceland? No it was not. Iceland was not an economic crisis. It was a financial crisis. Three years ago, we reached pre-crisis levels of economic volumes and have had sustained economic growth. We don’t want to find ourselves in this position again. Jeffrey Franks, IMF: The single best policy there is, is sustained economic growth, or there will be impact on poverty alleviation. We have taken policies around equality, gender and social protection to the core of our agenda. They are macro critical – critical to the performance of a country. The focus you see on these issues today were not evolved years ago, and we are not done evolving this framework. Our adjustment policies are taking in to account the need to be flexible to changing circumstances and go back to the IMF board and change the thinking around this. If a country has macroeconomic imbalance, no policy change is not an option. We must take in to consideration that no adjustment is not an option. 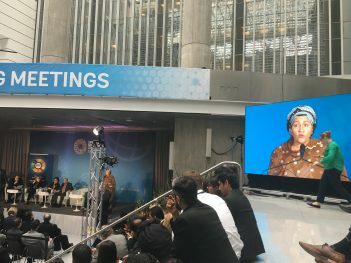 Notes from the 19 April Civil Society Policy Forum session on financing development through financial intermediaries at the World Bank and IMF Spring Meetings. Financial crisis 10 years on. Has the response to 2008 laid the foundations for the next? Notes from the 19 April Civil Society Policy Forum session on the response to the 2008 financial crisis at the World Bank and IMF's Spring Meetings. The promotion of Public-Private Partnerships – exporting a failed model? 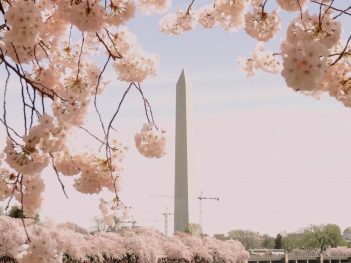 Notes from the 19 April Civil Society Policy Forum session on the World Bank's promotion of public-private partnerships at the World Bank and IMF's Spring Meetings. Big Shift: How can the Development Banks align with the Paris Agreement? 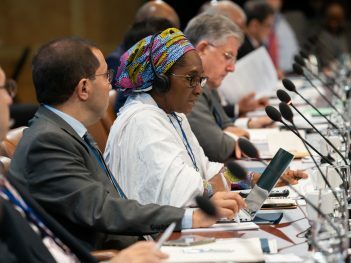 Notes from the 18 April Civil Society Policy Forum session on aligning multilateral development banks with the Paris Agreement at the World Bank and IMF's Spring Meetings. Notes from the 18 April Civil Society Policy Forum session on the World Bank's approach to financing energy access at the Work Bank and IMF's Spring Meetings. Notes from the 2017 World Bank and IMF Annual Meetings session on the IMF's approach to inequality, 13 October. Notes from the 2017 World Bank and IMF Annual Meetings Civil Society Policy Forum session on the challenges of effective governance of the oil, gas and mining sectors in resource-rich countries. Notes and video from the 2017 World Bank and IMF Annual Meetings session of the Civil Society Town Hall, 11 October. Notes from the 2017 World Bank and IMF Annual Meetings session on financing infrastruure in Latin America through PPPs. This session aims to discuss the main challenges pose by the widespread promotion of PPPs and its impacts in particular Latin American cases. Notes from the 2017 World Bank and IMF Annual Meeting Civil Society Policy Forum session on energy access, 11 October. Notes on the IFC's new approach to measuring development impact at the Civil Society Policy Forum 2017, 10 October. Notes of a UK CSO meeting with DFID on the annual meetings and the IDA process 23 September 2016. Notes from a side event at the IMF/World Bank 2016 annual meetings launching a new report on bonds issuance in Nigeria, Zambia and Ghana, followed by a panel discussion on government bonds as a debt issue. Notes from a side event on implementation of the new World Bank environmental and social framework, which took place during the World Bank-IMF 2016 annual meetings. Notes from a side event on citizen engagement in World Bank operations, which took place during the World Bank-IMF 2016 annual meetings. Notes from a side event at the IMF/World Bank 2016 annual meetings exploring the issue of vulture funds from various angles, as well as possible solutions. Notes from a side event on privatisation of education and low-fee private schools, which took place during the World Bank-IMF 2016 annual meetings. Notes from a side event on emerging lessions from indigenous peoples cases of the Inspection Panel, which took place during the World Bank-IMF 2016 annual meetings. Notes from a meeting on the World Bank safeguards review during the World Bank spring meetings. Notes from a meeting on energy during the World Bank spring meetings. Notes from a meeting on Ebola during the World Bank spring meetings. Notes from a meeting on the World Bank's Development Policy Finance retrospective during the Word Bank spring meetings. Notes from a meeting on the financial system and sustainable development during the World Bank/IMF spring meetings. Financing for development: What actions are needed on debt and illicit capital flows? IFC lending through financial intermediaries - a year on from the action plan, what have we learned? Financial tremors in developing countries: is another earthquake on the way? What does real accountability mean in practice? The best papers, books and electronic resources on the World Bank and IMF from 2013. Minutes from a side event with the World Bank safeguards team presenting an update on the review process during the World Bank/IMF annual meetings 2013. Minutes of a civil society meeting on upward harmonisation of World Bank safeguards during the World Bank/IMF annual meetings 2013. Minutes from a CAO sponsored event during the 2013 World Bank/IMF annual meetings. This session introduced the audience to an overview of global energy issues and specific analyses of the environment and economic impacts of Fukushima nuclear power accident, and discussed the roles of the financial sector in viable global energy future. Interaction between the Bank and CSOs on the approach paper through this panel provided an opportunity for the Bank and CSOs to highlight areas of importance and provide input about the direction of the safeguard review. This event was a collegial information-sharing and strategy session to explore the linkages between financial regulations and grass roots campaigns. This session discussed the conclusions reached on the global governance role of civil society by the Civil Society and Accountable Global Governance project. India's energy future: What role for the Bank? IFC staff member discusses plans for goals to guide future work in private sector development. Financial experts critically discuss commodity speculation. Held in reserve: can a new approach to monetary policy transform the global economic outlook? How to manage capital flows? 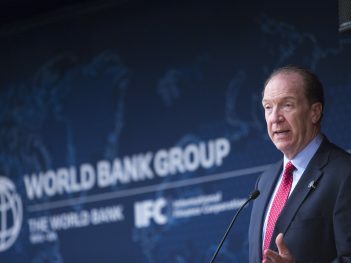 Future of the World Bank: major reforms or a series of minor adjustments? The IMF and protectionist trade policies: What does the record of the past 15 years tell us? Seminar on the IEo evluation of IMF trade policy advice in Istanbul, 2 October 2009. Programme of Seminars session in Istanbul on 3 October 2009 with Zeti Aziz, Andrew Crockett, Christine Cummings, Sayed Sadeeq, and John Laker. Summary of the first consultation on their new environment strategy, which they will develop next year. The impact of financial regulation on developing countries, World Bank Programme of Seminars, with Mingkang Liu, Joseph Stiglitz, and Alvir Hoffman. Notes of part of a panel debate chaired by Martin Wolf of the Financial Times, Istanbul, 4 October 2009. Growth commission event in Istanbul. Summary of a presentation made by Professor Anwar Shaikh, the New School for Social Research, on "Monetary Policy and the Global Crisis"
Notes of a session with the CAO at the World Bank spring meetings, Washington, DC, April 22, 2009. A briefing by IMF economists at the spring meetings 2008. Highlights of a 21 October discussion on the macroeconomics of aid scaling up at the World Bank-IMF annual meetings 2007. Highlights of a 19 October discussion on the reform of IMF governance at the World Bank-IMF annual meetings 2007. Highlights of a 19 October discussion on the role of low-income countries in IMF governance at the World Bank-IMF annual meetings 2007. Highlights of an 18 October 'town hall' meeting between WB-IMF heads and CSOs. Highlights of a 20 October meeting hosted by the FES Foundation on global public goods, at the World Bank-IMF annual meetings 2007. Highlights of a meeting at the World Bank-IMF annual meetings 2007. Highlights of a 19 October meeting at the World Bank-IMF annual meetings 2007. This panel discussion addressed the pros and cons of fiscal space for infrastructure when infrastructure is trade-related, what they mean for current proposals by the World Bank and IMF on fiscal space, and the importance of an assessment that looks jointly at the trade and financial aspects on the grounds of poverty reduction, development and environment goals. Highlights of a World Bank-organised dialogue on its new clean energy investment framework at the spring meetings in Washington, 24 April 2006. Briefing on the implementation of new IFC performance standards at the World Bank-IMF spring meetings in Washington, 20 April 2006. Dialogue on Fund role in middle-income countries at the World Bank-IMF spring meetings in Washington, Thursday 20 April. The session considered the arguments surrounding the provision of grants or loans by IDA. It considered the recent call by President Bush for the World Bank and other development banks to provide more of their funds to the poorest countries as grants, in recognition of the pivotal role that grants play in providing prudent financing for pressing development needs. Note from meeting in Washington between European IFI network and European EDs as part of the civil society programme of the World Bank and IMF Annual Meetings 04. BWP will provide analysis of the ministerial meetings’ communiqués, notes from CSPF seminars and more on BWP’s Dispatch page. Despite the idyllic setting and notwithstanding recent global growth, the 2018 World Bank-IMF Annual Meetings took place in a context of apprehension, which seemed unmatched by forceful action. 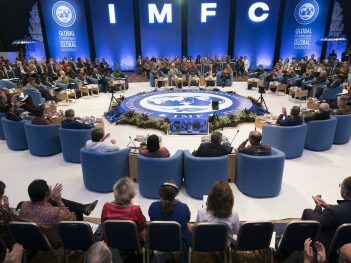 Analysis of the IMFC communiqué, issued on 12 October, from the 2018 World Bank and IMF Annual Meetings in Bali, Indonesia. 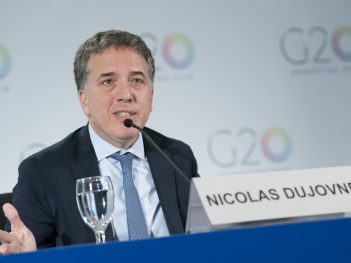 Analysis of the G20's press briefing on 12 October, following the Fourth Ministerial Meeting of Argentina's G20 Presidency, in Nusa Dua, Bali. 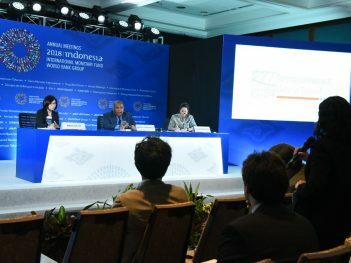 Analysis of the Development Committee communiqué released on 13 October at the World Bank-IMF Annual Meetings in Nusa Dua, Bali. 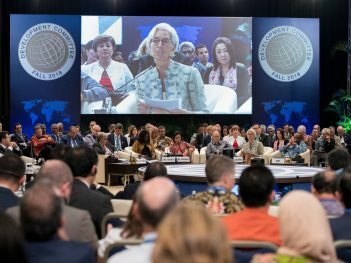 Analysis of the G24 communiqué, issued on 11 October at the 2018 World Bank-IMF Annual Meetings in Nusa Dua, Bali.